For many abortion patients, their clinic visit is a prime opportunity to receive contraceptive information and same-day services. Many providers are not equipped or staffed to offer a wide array of contraceptive methods immediately following an abortion. 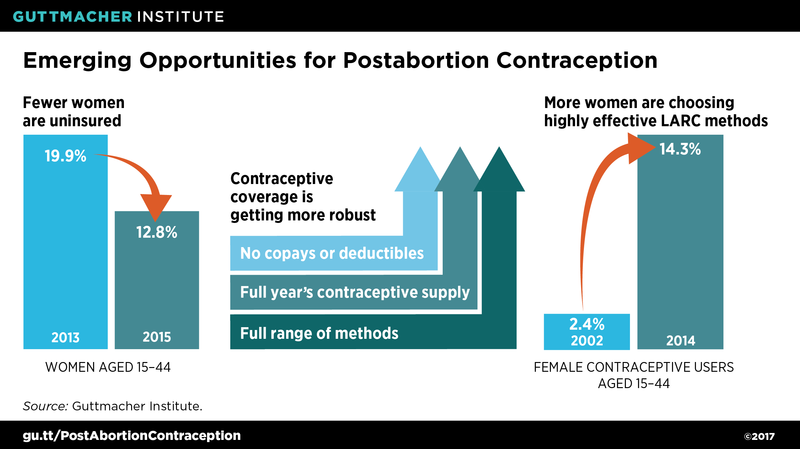 There are new opportunities for, as well as barriers to, increasing the availability of immediate postabortion contraception. Although most abortion providers integrate contraceptive counseling into abortion care to some extent, providing immediate, on-site access to a wide range of contraceptive methods has historically been more challenging. But the context in which abortion and contraceptive care are offered in the United States continues to shift, and recent changes in policy and practice offer up new opportunities for, as well as new challenges to, the provision of immediate postabortion care. Providing immediate access to contraception after an abortion can be challenging for abortion providers (see “Abortion Clinics and Contraceptive Services: Opportunities and Challenges,” 2011). For example, purchasing and stocking a wide range of contraceptive methods ahead of time—to ensure that each patient’s method of choice is always on hand—can be prohibitively expensive, especially in the case of long-acting reversible contraceptives (LARCs) such as IUDs and implants. Other major challenges involve navigating the world of insurance networks, billing and reimbursement. Insurance options for coverage of abortion or immediate postabortion contraception are limited by legal and administrative restrictions—both those in force and others perceived or misunderstood to apply—and providers are often subject to additional scrutiny, red tape or rejection because of their affiliation with abortion care. These challenges may be compounded for specialized abortion providers. They provide 59% of all U.S. abortions2 and focus primarily on abortion care, and therefore do not typically offer a broad range of reproductive health services.3 Because specialized providers are not designed or often seen as sources of comprehensive or ongoing care—whether for contraception or anything else—it can be all the more challenging for them to devote limited resources to offering more integrated care. For example, many specialized providers do not accept insurance;4 one common reason is that many abortion patients pay out of pocket because they are unable or unwilling to use their insurance for abortion care.5,6 Specialized providers may also face unique hurdles to the extent that their model of care does not already include clinic-based systems or regular training for offering contraceptive services. Not surprisingly, a nationally representative survey of abortion clinics found that specialized providers are less likely than those with a broader focus to offer a full range of contraceptive methods on-site, including immediate postabortion insertion of IUDs or implants.3 They are also particularly likely to rely on free samples of the pill, patch or ring, which means patients must proactively seek out ongoing contraceptive care from another type of provider. While many of these long-standing problems persist, there are also new opportunities to improve the provision of all types of contraception in a postabortion context (see Figure 1).7–9 Several changes to the health care system under the Affordable Care Act (ACA) have made contraception more affordable for patients. First, millions of people have gained health insurance coverage as a result of the ACA, and the uninsured rate among women of reproductive age fell by more than one-third over the first two full years of the law’s implementation.7 With increasing numbers of their clients obtaining health insurance, abortion providers—and specialized providers in particular—may have new incentives to establish relationships with insurers. Second, the ACA eliminated out-of-pocket costs, such as copayments and deductibles, for the full range of women’s contraceptive methods, including costly LARCs.8 Removing these cost barriers allows individuals to make choices about contraception without financial coercion—providing the freedom to select a method based on interest and suitability rather than cost or insurer preference. Moreover, some states have built on the federal guarantee by taking steps such as ensuring that patients can receive insurance coverage for a full year’s supply of contraceptives at one time (rather than for either one or three months at a time, as is typical).10 This development is especially important for abortion patients who are not interested in LARCs but may need time to find another type of provider for ongoing contraceptive care—if, for example, they do not live near the abortion clinic. The re-emergence of long-acting methods has also created new opportunities for postabortion contraception. The proportion of U.S. contraceptive users relying on LARCs jumped from 2.4% in 2002 to 14.3% in 2014, the highest level ever recorded in the United States.9 There is also some evidence that LARCs are highly desired by many abortion patients and that patient interest increases when LARCs are available for immediate postabortion initiation.1,11,12 Notably, all contraceptive methods, including LARCs, are appropriate for immediate uptake following a surgical abortion.13 In addition, recently updated medical guidelines support providing implants and injectable contraception at the time of a medication abortion, along with previously available methods like the pill, patch and ring; the IUD is now the only method that providers cannot offer on the day medication abortion is started.14 This broader array of options is particularly significant given that medication abortion represents an increasing proportion of all abortions nationally. Despite these promising developments, a new set of barriers has also emerged (see Figure 2).15–19 For one thing, the policy climate around abortion coverage has become increasingly hostile since the passage of the ACA, locking providers out of more insurance networks that could pay for postabortion contraception. Just three states—California, New York and Oregon—require private insurers to cover abortion. Twenty-five states limit abortion coverage in the ACA’s marketplaces, including 10 that restrict coverage in all private health care plans regulated by the state;15 Texas will become the 11th state to broadly restrict private abortion coverage when a new law goes into effect in 2018. These limits exist alongside the already burdensome Hyde Amendment, which bars federal Medicaid coverage of abortion in most circumstances; 35 states decline to extend state Medicaid funds to cover abortion beyond very limited circumstances.19 This increasingly restricted environment creates severe disincentives for insurers to contract with abortion providers—and specialized abortion providers in particular—and for providers to accept insurance if contracts are offered. Thus, even if a patient has contraceptive coverage, she may not be able to use it to pay for contraceptive services at an abortion clinic. Second, stepped-up attacks on family planning programs and providers threaten the future of postabortion contraception. Antiabortion policymakers are engaged in ongoing efforts to deny public funding to Planned Parenthood and other reproductive health care providers that offer abortion services.17 For example, they have attempted to bar such providers from receiving funds under federal programs like Medicaid and the Title X national family planning program, and have attempted to eliminate or reshape Title X based on the premise that it indirectly subsidizes abortion. The potential consequences of these proposals are profound (see “Beyond the Rhetoric: The Real-World Impact of Attacks on Planned Parenthood and Title X,” 2017), and they are particularly perverse in the context of postabortion contraception. Forcing further segregation of abortion and contraceptive services will only limit contraceptive options for patients seeking abortion care, increasing the risk of having a future unintended pregnancy. A third major obstacle to postabortion contraception is that access to abortion care has become more limited, leaving fewer opportunities and resources for integrated care. Because of an increasingly restrictive legal environment and clinic closures across the country, abortion patients are facing new barriers to care, including the need to travel greater distances to access services.2,20 Overcoming these challenges can be difficult or impossible, especially given that 75% of abortion patients are low-income, and 59% have already had a child and may have other family obligations.21 Whether a provider offers same-day contraceptive services is irrelevant if a patient cannot access abortion care in the first place. Moreover, the ever-increasing weight of these restrictions may strain providers’ financial and staffing resources, making it all the more difficult to offer services other than abortion. Abortion providers face a range of long-standing and more recent barriers to the provision of immediate postabortion contraception, many of which are compounded for specialized providers. Yet many of these barriers could be addressed, and even overcome, without significant policy changes. For example, clinics could increase efforts to accept a wider variety of insurance plans, including hiring dedicated staff to focus on credentialing and billing issues—and they have new incentives to do so because more of their patients are insured as a result of the ACA.22 State and federal Medicaid officials, too, could address many reimbursement issues for postabortion contraception. For example, they could designate specific billing codes for postabortion procedures, signaling to providers that they encourage postabortion contraception. If Medicaid takes the lead, private health insurance plans may follow suit. Clinics could also take additional steps to facilitate on-site provision of contraceptive services, such as seeking out new training or staff and restructuring their intake and clinic-flow practices to better facilitate comprehensive and patient-centered contraceptive counseling and services. Again, investing time and resources in these changes may be more practical now than ever before, given improvements in contraceptive coverage and the wide range of options available to patients immediately after an abortion. Moreover, even where barriers to fully integrated care remain high, providers could improve their referral networks so that they can connect patients to contraceptive care at facilities offering a wider range of options and implement practices to promote follow-up care with patients’ regular family planning providers. At the same time, other barriers to postabortion contraception could only be lifted through federal and state legislation. Policymakers and advocates must continue to work to reverse restrictions on insurance coverage of abortion, to stop the incessant attempts by antiabortion policymakers to drive a wedge between the provision of abortion and family planning services, and to lighten the burden of abortion restrictions more generally on patients and providers. Otherwise, abortion providers will continue to be marginalized in ways that prevent them from meeting all of their patients’ needs—for both abortion and contraception. The fact that most abortions result from unintended pregnancy underscores the importance of postabortion contraception to patients and society, but in many ways, its potential has not been fully realized. For those patients who want it, providing immediate access to contraception at the time of abortion care not only makes practical sense, it fulfills their rights to comprehensive and patient-centered care. 1. Kavanaugh ML, Carlin EE and Jones RK, Patients’ attitudes and experiences related to receiving contraception during abortion care, Contraception, 2011, 84(6):585–593. 2. Jones RK and Jerman J, Abortion incidence and service availability in the United States, 2014, Perspectives on Sexual and Reproductive Health, 2017, 49(1):17–27, https://www.guttmacher.org/journals/psrh/2017/01/abortion-incidence-and-service-availability-united-states-2014. 4. Kavanaugh ML, Jones RK and Finer LB, Perceived and insurance-related barriers to the provision of contraceptive services in U.S. abortion care settings, Women’s Health Issues, 2011, 21(Suppl. 3):S26–31. 5. North A, Sometimes the biggest obstacle to abortion is insurance, Vox, Aug. 31, 2017, https://www.vox.com/policy-and-politics/2017/8/31/16229654/abortion-insurance-hyde-amendment. 6. Jones RK, Upadhyay UD and Weitz TA, At what cost? Payment for abortion care by U.S. women, Women’s Health Issues, 2013, 23(3):e173–178. 8. Sonfield A, States must act to shore up the federal contraceptive coverage guarantee, Guttmacher Policy Review, 2017, 20:31–34, https://www.guttmacher.org/gpr/2017/02/states-must-act-shore-federal-contraceptive-coverage-guarantee. 9. Kavanaugh ML and Jerman J, special analysis of the 2013–2015 National Survey of Family Growth. 10. Guttmacher Institute, Insurance coverage of contraceptives, State Laws and Policies (as of September 2017), 2017, https://www.guttmacher.org/state-policy/explore/insurance-coverage-contraceptives. 11. Goyal V et al., Postabortion contraceptive use and continuation when long-acting reversible contraception is free, Obstetrics and Gynecology, 2017, 129(4):655–662. 12. Langston AM, Joslin-Roher SL and Westhoff CL, Immediate postabortion access to IUDs, implants and DMPA reduces repeat pregnancy within 1 year in a New York City practice, Contraception, 2014, 89(2):103–108. 13. Roe AH and Barz D, Contraception after surgical and medical abortion: a review, Obstetrical and Gynecological Survey, 2017, 72(8):487–493. 14. National Abortion Federation, 2017 Clinical Policy Guidelines for Abortion Care, 2017, https://prochoice.org/resources/clinical-policy-guidelines/. 15. Guttmacher Institute, Restricting insurance coverage of abortion, State Laws and Policies (as of September 2017), 2017, https://www.guttmacher.org/state-policy/explore/restricting-insurance-coverage-abortion. 16. Donovan MK, In real life: federal restrictions on abortion coverage and the women they impact, Guttmacher Policy Review, 2017, 20: 1–7, https://www.guttmacher.org/gpr/2017/01/real-life-federal-restrictions-abortion-coverage-and-women-they-impact. 17. Guttmacher Institute, Family planning funding restrictions, Evidence You Can Use, New York: Guttmacher Institute, 2017, https://www.guttmacher.org/evidence-you-can-use/family-planning-funding-restrictions. 18. Nash E, special analysis of state abortion restrictions 1973–2017. 19. Guttmacher Institute, State funding of abortion under Medicaid, State Laws and Policies (as of September 2017), 2017, https://www.guttmacher.org/state-policy/explore/state-funding-abortion-under-medicaid. 21. Jerman J, Jones RK and Onda T, Characteristics of U.S. Abortion Patients in 2014 and Changes Since 2008, New York: Guttmacher Institute, 2016, https://www.guttmacher.org/report/characteristics-us-abortion-patients-2014. 22. Sonfield A and Gold RB, Beyond consent to sterilization: facing up to the full range of barriers to post-abortion contraception, American Journal of Obstetrics and Gynecology, 2014, 211(1):3–4, http://www.ajog.org/article/S0002-9378%2814%2900475-X/fulltext.